St. Louis, Old Chain of Rocks Bridge is now a bicycle and pedestrian path. 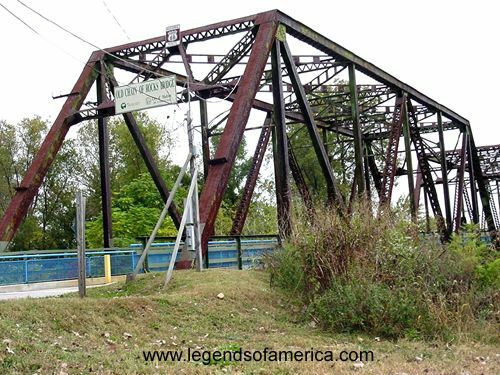 The “Show Me State” of Missouri not only has some of the most scenic views of the Mother Road, it also has dozens of vintage icons along the old highway, many of which can still be visited today. From the Mississippi River in St. Louis to the plateau region beginning at Springfield and ending at the Kansas border, Missouri’s 300-odd-mile-journey provides a multitude of picturesque scenes along old Route 66. The old highway closely follows the route of an ancient pre-Civil War stage line and today, it parallels and zigzags across Interstate 44. Many signs of the old highway survive on the stretches of the original ribbon of highway, but if you prefer the interstate, every exit will land you within a moment’s drive of original Route 66. Along the way, you will see some of the Mother Roads best tourist attractions, including the Route 66 State Park and Meramec Caverns, as you wind across the “Show Me State” of Missouri. Vintage icons such as the Chain of Rocks Bridge and Ted Drewes Frozen Custard in St. Louis, the Munger-Moss Motel in Lebanon, and the Boots Motel in Carthage provide great photo opportunities. In addition, the Missouri route also provides an abundance of side trips to great travel destinations, in and of themselves, such as Lake of the Ozarks and historic Branson, Missouri. A very large portion of what was once Route 66 in Missouri is still under state jurisdiction as either primary or secondary state highways. While its “official” state designation may not always be “66,” Missouri has more miles of the old highway under state management than any other state. The State of Missouri has done a good job of installing commemorative Route 66 signs along the old highway; however, you will still need a map, as these signs will not always tell you when the road turns. Ted Drewes in St. Louis, Missouri. Click for prints and products. Beginning your journey in St. Louis, check out the Chain of Rocks Bridge before you venture into the city, where you’ll see numerous historic buildings and the St. Louis Arch. 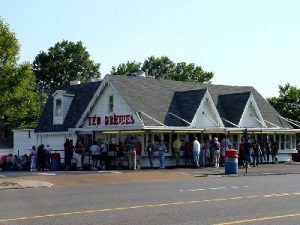 On your way out of St. Louis be sure not to miss Ted Drewes Frozen Custard which has been dazzling taste buds since 1929. Moseying on down the road, you will soon approach the Route 66 State Park, once the site of Times Beach, which was completely evacuated and “mowed down” due to chemical contamination. At the park you can see Route 66 exhibits that chronicle the history of the Mother Road as well as the story of the ill-fated town. In the town of Gray Summit, you can stretch your legs among the Missouri wildflowers at the Shaw Arboretum of the Missouri Botanical Garden. Continuing along your way, a “must see” along your journey is Meramec Caverns in Stanton, Missouri , which has been enticing visitors since 1933. While you’re in Stanton, you can also visit the Jesse James Museum. Be sure to take a peek at the Wagon Wheel Motel and the former Midway Restaurant and Garage as you travel through Cuba. Along this stretch of the road begins one of Missouri’s finest wine and grape producing regions. Some vineyards can be observed from the road and you’ll find several roadside stops selling grapes, grape juice, wine, honey, and other locally produced products in the summer and fall months. Rolla, Missouri provides several vintage views of Route 66 as well a popular auto museum called Memoryville USA. For an interesting look something else altogether, visit the Rolla Stonehenge, a partial reconstruction of the ancient megalith, built by students at the University of Missouri at Rolla. Continuing along towards Devil’s Elbow, your journey will provide an extremely scenic route along the bluffs over the Big Piney River. Sheldon’s Market and the Elbow Inn Bar and Barbeque Pit, both vintage Route 66 businesses, are interesting stops in Devil’s Elbow. Soon, you’ll arrive at the historic town of Waynesville, Missouri, which not only displays vintage peeks of the Mother Road, but also several historic buildings that date back to the days of the Civil War. Wrink’s Market in Lebanon, Missouri, October, 2004, Kathy Weiser. 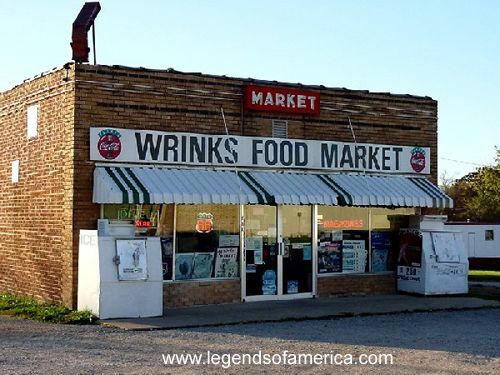 In Lebanon, you can see the 1940s Munger-Moss Motel; still open today, as well as Wrink’s Market, which stood as a Route 66 institution for more than a half a century. Today, it sadly empty. Continuing on to Springfield, you will view great architecture as you continue on your westward trip. Beyond Springfield is an extremely vintage portion of the highway that was bypassed long ago. Along this stretch, you will see several sad and forgotten towns that died at the hands of newer transportation routes. These old towns include Halltown, Paris Springs Junction,Spencer, Heatonville, and several others. Soon, you will enter the historic town of Carthage, filled with Victorian Homes and a wealth of history – from the Civil War to an abundance of Route 66 icons. Continue your asphalt trip through Webb City and Joplin before entering the state of Kansas , with its “full” 13 miles of Route 66. As always, enjoy the ride! !